Shekhar Gupta's anthology is a valuable addition to our understanding of the seeming muddle that is India. The experience of reading his columns is more like a chat with a friend in the afterglow of an enjoyable drink, but never frivolous, says Shreekant Sambrani. Reading the collection of the weekly columns of Mr Shekhar Gupta, the long-serving editor-in-chief of The Indian Express, is a little like eating at Barbeque Nation franchises. The set-menu restaurant serves you such a quantity and variety of mouth-watering hors d'oeuvres at your table that you sometimes don't quite relish the equally delicious main courses. Mr Gupta's columns, regardless of the subject, are redolent with so many anecdotal tid-bits that it is possible to occasionally overlook the main point. And also like the Barbeque Nation meal, where one always leaves a little room for the last temptation of desserts, Mr Gupta's mini-essays often have very satisfying post-scripts. Take, for example, 'Tearing down Narasimha Rao'. Mr Gupta's phenomenal access to politicians, serving and especially, just out of office, is well-known. The much-maligned and in Mr Gupta's opinion, far too poorly appreciated (fully endorsed by this reviewer) former prime minister opened out to the editor as he seldom did to anyone else. In the process, he said to Mr Gupta in Hindi, 'Some say I stole the hen, some say I stole the eggs, but they all agree that I am a thief anyway.' That is a remarkable quote, but only one among many. You almost miss the central point: Rao may have failed to prevent the destruction of the Babri Masjid, but his critics in the Congress did their own party incalculable harm by spreading the canard that the Rao government was responsible for that crime. And for desserts, we have the wisdom that apart from crafting the post-Cold War diplomacy and launching reforms, Rao's most significant contribution was that he 'discovered the political talent and promise of a quiet economist called Manmohan Singh'. If there is a better 1,500 word assessment of the major architect of India of the last quarter century, I am yet to read it. Mr Gupta says the late Hindi editor Surendra Pratap Singh virtually bullied him into starting his column if he 'wanted to be taken seriously as an editor'. For this we must be grateful to Mr Singh, because otherwise we would have missed this most influential commentary on Indian politics. In an aside, Mr Gupta says he chose the title National Interest for his columns because that gave him the 'freedom to write on anything, from politics to defence, security and foreign policy to cricket' (and I might add, very occasionally on that other staple of the Indian mindspace, films). Indeed, some of Mr Gupta's 900-odd columns (by his own count) in the last 19 years are on these diverse subjects (by my own admission, I must have read most of them), but it is his political analysis that is riveting for serious students of India and casual readers alike. India does not lack in professional political scientists who write for the press (and many others who are distinguished members of the academia, both Indian and non-Indian). Nor is there any dearth of the more garden-variety political journalists either. What makes Mr Gupta's a stand-out act in this crowded field, especially since he has serious competition in his own paper (I am sure by design) from such luminaries as Pratap Bhanu Mehta and Ashutosh Varshney? In my view, two factors: First, an astute judgment leading up to unerringly accurate reading of leaves. That would be otherwise called an instinct, but long years of cogitation have taught me that they are in fact impeccable analyses which occur so rapidly that make even the thinker believe that they are instinctive insights because all the steps are not immediately evident. Only animals threatened with imminent demise and congenital gamblers display instincts. Mr Gupta is neither. What he possesses in abundance is knowledge of political patterns, past, present and emerging, and an ability to fit them to the situation at hand. That makes his pronouncements seem uncanny, but if one bothers to think along with him, one would be persuaded by the sheer compulsive logic. Admittedly, this does not happen in case of newspaper columns because today's edit page wisdom is tomorrow's pakora wrapper. That makes an anthology like this a valuable addition to our understanding of the seeming muddle that is India. Second, Mr Gupta, unlike almost all the other pundits who are so full of their tiresome scholarship, is eminently readable. He carefully wraps the gravitas of his thoughts into anecdotes, which makes the reader wanting more of it. His choice of words is remarkably felicitous and free of cant and jargon. The experience of reading his columns is more like a chat with a friend in the afterglow of an enjoyable drink, but never frivolous. He breaks the golden rule of journalism, that of not making the person of the writer also a part of the conversation in the commentary (as many leading American columnists do), but it smacks of boasting only rarely, which the reader is quite happy to forgive him. That is quite an achievement for one who calls himself an HMT (Hindi-medium-type). I should know, being an MMT (Marathi-medium-type) myself. The elegantly written columns have more often than not irresistible titles, all handiworks of Mr Gupta and his dedicated team. They keep changing, as I discovered myself. The title that appears in my local Vadodara edition (which is printed at 8 pm the previous evening) is not always the same pithy one that I see on the e-paper. I used to think that the resident editor did dirty on the editor-in-chief until I realised that the boss himself played around with titles until the last possible moment. That is alright with me if I get to read 'So Nehru killed Gandhi! ', 'Meena Kumari politics', 'Yes we can't' and 'Jantar, chhu mantar', to name just a few. Twelve years ago, only Mr Gupta (and in a minor way, yours truly) was marking the subject of the current referendum masked as a general election as a star to watch. He continued to do that in 2007 as well, when again, Mr Mehta and I were the only other observers to spot the trend. He also anticipated, in 2002 at that, your-riots-vs-our-riots (1984 versus 2002) as a theme to emerge in future electoral battles. This has been amply borne out in the last few months. Surely the razor sharp judgment of the good editor was dulled, probably by the not entirely confidence-inducing appearance of the said Mr Shah (he would have been among a host of others so swayed by this aspect), whose overlordship of the electorally most important state for close to a year is now universally acknowledged as the most inspired piece of strategy. The 2014 Indian election campaign has highlighted like nothing else before the enormous power of the media in India. Rare is the individual who escapes the cacophony of the nightly clamour on our enormous number of news channels in all languages, reaching every corner of the country. That is also a cause for concern, for two reasons. The first is the so-called paid news, where money plays the arbiter of truth. Just as bad, if not worse, is the questionable maturity and wisdom of the anchors, who have attained stardom now. They do not so much moderate the discussion as actively push it in whichever direction their fancy takes. We do not have the equivalents of Walter Cronkite, who had the courage of his conviction (or as the Americans call it, truth to power) to raise his very powerful and persuasive voice against what the war in Vietnam was doing to that benighted country and to the United States. Uncle Wally speaking thus swayed many a family for good. In India, despite the many claims (mostly by itself), individual and collective, the new stars of the electronic media, have miles to go before they come up to these standards. The reasons are not far to seek. Their breathless manner even while chasing the smallest story, their lack of in-depth understanding (they are experts on any and everything) and their preoccupation with themselves bordering on obsession are the possible reasons. The most important, of course, is that they have no reverence or commitment to all facts -- they pick and choose what suits their pre-determined mindset. That is where the print media comes in, and not for small measure either. In this vast country, everyone reads a newspaper. That is why even as the broadsheets and tabloids are on their way out in the West, they thrive in India. But here too, the commitment to truth to power is less than absolute. Editorial freedom is mostly a luxury, and the larger the group, the more so. Like many in my generation (correction: That should be the previous generation!) I have grown up thinking that if I do not read at least four papers a day from end to end, I have not earned my meal. In this world, newspaper editors occupy a hallowed place. I would like to mention some exceptional ones, from the past as well as the present. Mr Govind Talwalkar, the extraordinarily erudite long-time editor of the Maharashtra Times and the true successor of the late Sham Lal in terms of his varied interests and voracious reading, pursued facts away from the limelight in an extraordinary manner. It was he who exposed Mr A R Antulay in the early 1980s, although the credit went to Mr Arun Shourie. The pursuit of the Bofors case by The Indian Express and The Hindu teams, under the editorship of Mr Shourie and Mr N Ram was extraordinary. Their tenacity and reverence for facts and details are as yet unmatched in the Indian press. Mr M J Akbar, who is presently in the news not because of his editorial laurels but because his late conversion of being Mr Modi's spokesperson, has perhaps been the most original journalist India has seen in the last 50 years. His bold experiments of the weekly Sunday and the daily Telegraph are textbook cases of innovation in an area not otherwise known for it. His talents as a wordsmith are par excellence. My dear friend T N Ninan redefined business journalism and made it both excitingly readable and far more responsible than anything known in India. And then there is Mr Gupta, of course. In the final analysis, the Fourth Estate has a Vidura-like role to perform in a functioning democracy. The half-brother of Pandu and Dhritarashtra did not hold any temporal power, but he was wise and could counsel his brothers and nephews like no other could, because he was their conscience-keeper. Words, but not empty ones, are more potent than the State power, as Emile Zola proved with his J'accuse in 1898. That is all the more reason to wish more power to Mr Gupta's extraordinarily fluent pen. 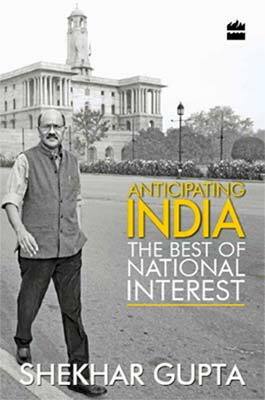 Anticipating India, The Best of National Interest, by Shekhar Gupta, HarperCollins. Buy the book at the Rediff Bookstore. Rs 159 off the sale price!